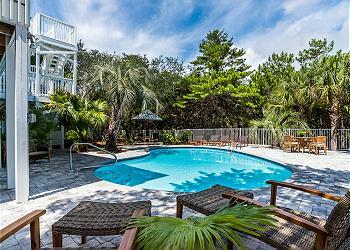 - This home is walking distance the beach. DETAILS: This stunning and recently renovated Grayton Beach home is walking distance to the beach and the definition of “Serenity by the Sea”! 98 Seville Drive boasts 5 bedrooms, 4.5 bathrooms, spacious accommodations for 17 guests—perfect for your dream 30A getaway. On the first floor, guests will enjoy the secondary living area, which offers a large flat screen television and ample comfortable seating arrangements—including a lovely double sleeper sofa. The nearby kitchenette features a coffee maker, mini fridge, and microwave—a perfect place to prepare popcorn and snacks for a family vacation movie night! The game room also offers another fun entertaining area. This level boasts a beautiful queen bedroom and private bathroom with a shower. Kids will love the bunk room, which is perfectly outfitted with two sets of twin-over-twin bunk beds, one twin trundle, and a shared bathroom with a shower and marble vanity. The second floor features an open-concept floorplan with a perfect flow between the kitchen, dining, and living areas. The chef’s kitchen features bright white cabinetry and countertops, stainless steel appliances, and lots of natural light. The dining area offers seating for 6 guests—combined with 5 additional seats at the breakfast bar, there’s room for everyone in your large group! Plush sofas, comfortable armchairs, and a large flat-screen television offer a relaxing place to unwind in the living room. French doors lead to the spacious second-floor balcony—one of the home’s lavish outdoor spaces. This level offers an additional living area with a comfortable queen sleeper sofa; two guestrooms with lovely seagrass queen beds; a beautiful shared bathroom with a glass-front shower; and a spacious laundry/utility room with a full-size refrigerator/freezer. The stunning master bedroom boasts a beautiful seagrass king bed, a mounted flat-screen television, French doors to access the second-floor balcony, and a private en suite bathroom with a glass-front shower and a large dual-sink vanity. Soak in the serene and breathtaking gulf views from the observation deck and enjoy a relaxing day by the home’s large private pool. Take a short walk to the beach, sink your toes in the sugar white sand, and let the sparkling emerald waters wash your cares away. Five custom 360 Blue beachcruiser bikes offer a wonderful way to experience the local flavors of Grayton Beach and nearby 30A coastal towns. 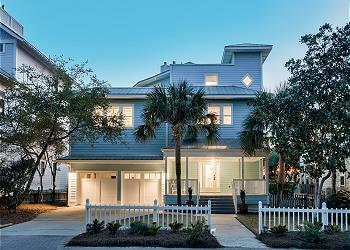 Experience “Serenity by the Sea” in this incredible Grayton Beach home. 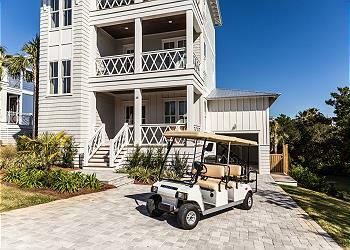 Book your next 30A vacation at 98 Seville Drive by contacting 360 Blue today! We had a wonderful time! This house was perfect for our crew of 16- 8 kids and 8 adults. Plenty of room, lovely accommodations and terrific service! Thank you 360 Blue! Everything exceeded our expectations! This house is perfect setup for a beach vacation. We had 8 people in the house at one time and there was room for few more. I was here for Songwriters Festival along with my family and a few extra friends. The "boys" and my son stayed on the first floor with a BR and BA along with Bunkroom and another bath, kitchenette, and really comfortable living room. The upstairs is where my family stayed and it was amazing. The kitchen is great but the butler pantry and extra refrigerator was awesome and would accommodate a couple families with children pretty easily. The pool area was amazing and the crows nest has beautiful views. It's a must see. I also was able to watch the recent renovation as I'm building a home in the area as well. It is so nicely done and comfortable with plenty of outdoor seating and comfortable nooks. The location is prime as quick walk to beach, secluded neighborhood, but close to all the action when/if you want it. One of the best beach homes I've ever stayed in and we're beach vacationers! 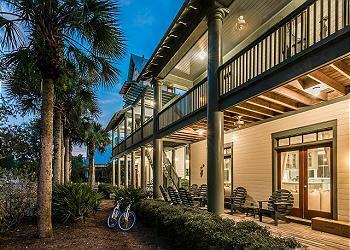 We are so thrilled that you enjoyed your stay with us in Grayton Beach! We agree that this home has wonderful accommodations for the entire family and the outdoor space is second to none! Thank you for staying with 360 Blue, we hope to see you again soon!